There is still a lot we don’t know about the events that led to the takedown of Malaysia Airlines flight MH17 that killed 298 people Thursday. President Barack Obama briefed reporters Friday with the latest information. We have rounded up those details, plus information provided by U.S. Ambassador to the U.N. Samantha Power, in her briefing to the president on Friday. Read her full remarks here. On Thursday, Malaysia Airlines flight MH17 departed Amsterdam en route to Kuala Lumpur, Malaysia. 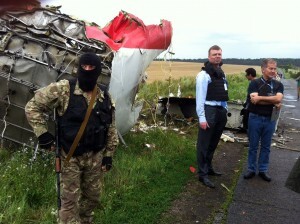 The plane was shot down over eastern Ukraine near the Russian border. Malaysia Airlines said the flight plan was approved by Eurocontrol, the agency responsible for determining civil aircraft flight paths over European airspace. All 298 people on board the flight were killed. There was at least one American on board who President Barack Obama identified as Quinn Lucas Schansman. According to Malaysia Airlines, most of those on board were Dutch, accounting for 189 passengers; 44 were from Malaysia; 27 Australia; 12 Indonensia; 9 UK; 4 Belgium; 4 Germany; 3 Philippines; 1 Canada; 1 New Zealand. Four passengers’ nationalities remain to be verified. U.S. intelligence authorities believe that a surface-to-air missile, an SA-11, shot down the passenger plane as it flew over eastern Ukraine. According to a briefing by U.S. Ambassador to the U.N. Samantha Power on Friday, an SA-11 system was reported near Snizhne by a Western reporter, and Russian separatists were spotted hours before the incident with an SA-11 SAM system at a location close to the site where the plane came down. Power also said that Ukraine also has SA-11 SAM systems in their inventory, but the U.S. is not aware of any Ukrainian SAM systems in the area of the shoot-down. Power said that separatists initially claimed responsibility for shooting down a military transport plane and posted videos that are now being connected to the Malaysian Airlines crash. Separatist leaders also boasted on social media about shooting down a plane, but later deleted these messages. On Monday separatists claimed responsibility for shooting a military transport plane in eastern Ukraine. That plane was traveling at an altitude of nearly 20,000 feet. And on Wednesday, separatists claimed responsibility for downing a Ukrainian fighter jet. On Friday, President Obama called for an immediate ceasefire in the area to allow for an unfettered investigation. We don’t know who fired the missile. Ukranian president Petro Poroshenko and Russian president Vladimir Putin deny that their countries were involved in the attack. An intercepted phone call points to pro-Russian separatists in Ukraine, but the recording’s authenticity is unconfirmed. We don’t know the intentions of those who launched the missile. We don’t know the location of MH17’s black boxes. The Interfax-Ukraine news agency reported that both black boxes have been recovered. The agency also reported that one has been sent to Moscow, which Russian Foreign Minister Sergei Lavrov denies.